Located within Orange County’s Lake Forest, the Santiago De Compostela Catholic Church provides a dramatic setting for couples of the Catholic faith to exchange vows. Despite its unconventional facade and modern architectural features, the church retains a sacred ambiance, and its light-filled interior is ideal for wedding day photography. Elegant wooden pews flank the aisle and neutral tones give warmth to the overall setting. You can add in your own floral arrangements or decorations to add color and depth to the church, and the choice of a full Catholic Mass or revised version is up to you. Unlike many churches, the Santiago De Compostela Catholic Church is spacious on both sides, allowing your wedding photographer to capture multiple angles as you say “I do” and get up-close candid shots of your reactions (and those of your loved ones) throughout the ceremony. 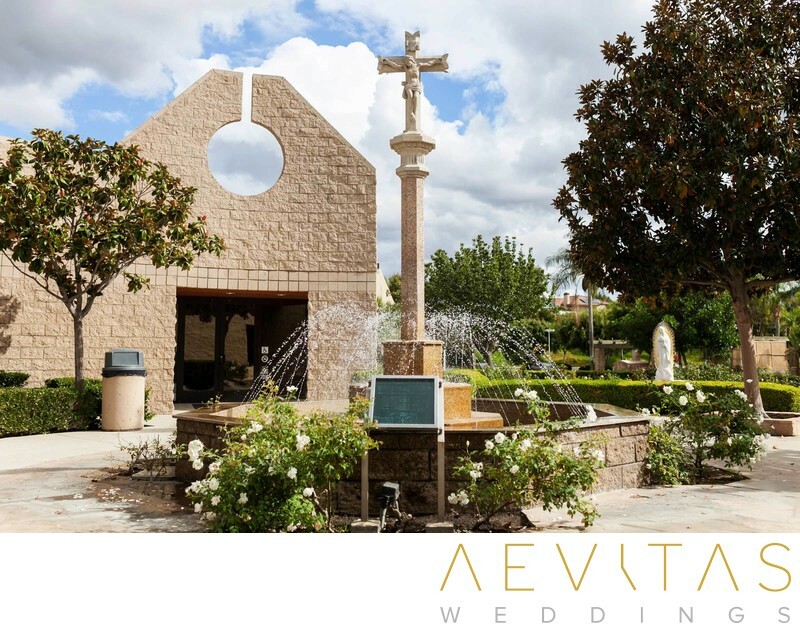 Following your wedding ceremony, there are lots of shaded areas outside for capturing couple portraits, bridal party portraits and family formals incorporating the architecture of the Santiago De Compostela Catholic Church, as well as a charming courtyard fountain with a cross at its center. If time allows, family formals can also be taken at the altar, backed by its impressive wooden cross. There is a small room for the bride to get ready in on-site, or you can use it to freshen up before the ceremony after getting prepared at a nearby hotel. Because multiple weddings are often held on the same day at the Santiago De Compostela Catholic Church, couples need to consider their time restraints and ensure their wedding day schedule is adhered to. Santiago De Compostela Catholic Church’s dramatic architecture and sacred ambiance makes it an ideal setting for Catholic couples whose religion holds a central role in their wedding day celebrations.